In the classic underground movie book Visionary Film, historian P. Adams Sitney coined the term “trance film” to describe the primary type of post-WWII avant-garde cinema that was in vogue at the time. In Sitney’s view, short movies such as Maya Deren‘s Meshes of the Afternoon, Kenneth Anger‘s Fireworks and Stan Brakhage‘s Flesh of Morning all feature somnambulist protagonists wandering through surrealist nightmare worlds of their own psyche. Movies featuring sleepwalking main characters are, of course, the antithesis of popular mainstream entertainment, which at all times attempts to thrill the masses with tales of heroes of extraordinary abilities doing amazing things. Flash forward about 70 years and Don Swaynos‘ debut feature film, the surrealist comedy Pictures of Superheroes, doesn’t quite fit Sitney’s “trance” mold, but it’s main character, professional cleaning woman Marie (Kerri Lendo), does appear to be sleepwalking through her life. The film opens with Marie confronted by two harsh realities: One, her douchebag boyfriend Phil (Byron Brown) doesn’t love her anymore and, two, the cleaning service she’s been working for is actually a front for a prostitution ring. The fact that she naively never put out for her clients gets her fired. 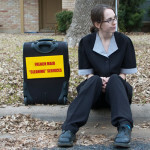 Rather than being jolted awake that her entire adult life has been a fraud, Marie ambles her way into an uncertain future, dragging her little suitcase of cleaning supplies behind her. Then, through no initiative of her own, she lucks into a job cleaning up the house of a spastic and neurotic businessman, Eric (Shannon McCormick). Swaynos’ twist to the conventions of the trance “genre” (as it were), though, is that, in a way, Marie’s somnambulism allows her to see reality more clearly than anybody else who crosses her path. In that, much of the film’s comedy arises from Marie’s Bob Newhart-esque deadpan reaction to the insanity going on around her. The comparison to Newhart is particularly apt given Lendo’s background in stand-up comedy. For a leading role for a non-professional actress, Lendo been assigned the extremely difficult task of performing as a character who is pretty much disengaged from the world, but who also must be compelling enough that the audience wants to stick with her until the end. And she pulls it off with greatly admirable skill and grace. While Marie might be sleepwalking through her life that doesn’t mean that Lendo doesn’t imbue the character with the emotion and depth she needs to give her a fully rounded personality. But, it is Marie’s ability to remain mostly non-plussed is her most admirable quality and goes far in explaining why so many lunatics are drawn to her — and why we feel compelled to watch and root for her. The most touching relationship — in its own curious, demented way — in the film is between Marie and Joe (John Merriman), a shiftless man-child who is freeloading at Eric’s place without Eric’s knowledge. Joe is like a Will Ferrell or a Zach Galifinakis character on Valium. Lots of Valium. Completely delusional, Joe imagines his casual acquaintance with Marie is a romantic one, counting each minor conversation between them as a “date.” (They end up having about eight or nine total by Joe’s count.) And Marie gamely plays along and lets Joe hang around while she runs Eric’s errands because, at least with his fixation on eating candy and outsider art drawings of superheroes, Joe is a harmless, non-threatening male presence. What makes Pictures of Superheroes a real gem of a comedy is the way Swaynos, who also wrote the script, has crafted a perfect little surreal universe that never betrays its own self-contained operating system. And despite most of the characters exhibiting extreme quirks — Marie’s passivity, Joe’s naivety, Eric’s workaholism, Phil’s douchebaggery — the humor that arises from their interactions is all good-natured and never mean-spirited, even when it involves one of Eric’s bigoted clients or an entitled, offensive sitcom star who hosts Eric’s roast in the film’s finale. Furthermore, as writer-director, in addition to crafting some extremely funny scenarios and lines Swaynos pays perfect attention to his character’s details. For example, for perhaps 98% of the film, we never see Marie not wearing her maid outfit, even when she’s not scrubbing Eric’s house down. However, whenever somebody tries to point out to her that her identity is wrapped up in her career, Marie vehemently denies that she enjoys being a maid at all while at the same time is unable to plot any other different course for her life. 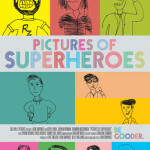 The pictures of superheroes of the movie’s title seems to refer to Joe’s crude little scribblings that he shares with Marie, yet it could also be read as an ironical commentary on the lives of the film’s characters. Everybody’s individual quirk is sort of like their own non-heroic superpower with the real “hero” being Marie whose simple questioning of her friends’ ill-conceived non-logical ordering of the universe inspires them to discover their true nature no matter how much Marie is oblivious to her own.